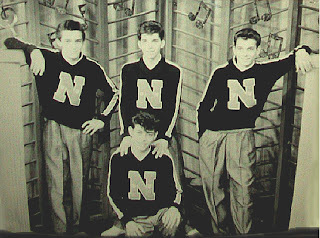 New Heaven,Connecticut group formed by Dicky Bernando,Joey Kakulis,Sal Tramauche and Pat Cosenza. WHY "POOR ROCK AND ROLL"?. Well it seems that one of the new Heaven officials had just banned an Alan freed Big Beat Show which was to be held in the Elm City and The Nobles decided to do a song about "the latest attack" on Rock & Roll. -Why Be A Fool/The Search. In 1958 Nickie"Little Nickie"Delano joined The Nobles and as Nicky & The Nobles recorded_School Bells/School Day Crush. on the Gone Label. 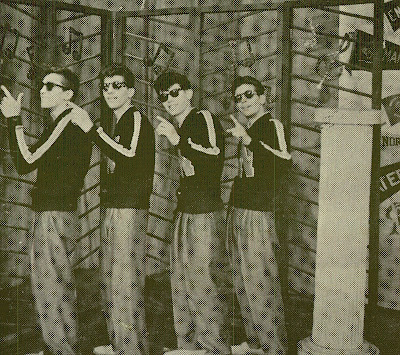 After Nickie left the group(was replaced by Mario Giaino) and he was part of The Barries(see in this blog). -Schoolhouse Rock/A Way To Tell Her. End Records-1958. 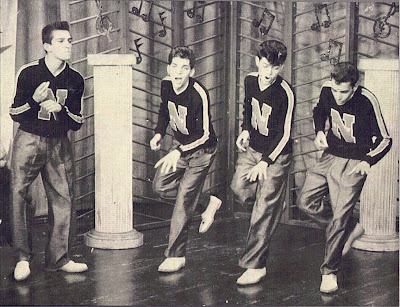 In The Complete Book Of Doo Wop this recording is listed as by THE NOBLES actually is Nicky De Matteo with an unknow group. In 1976 Robin Hood Records released the Noble's demo_Oh Baby. as a single(B Side by The Blue Dots). Do know where the photos were taken. ?